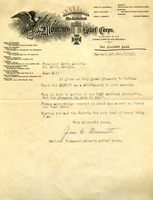 Josie C. Bennett writes on behalf of the Women's Relief Corps with a check for 150 dollars, one scholarship, and she wishes that it will make someone happy. 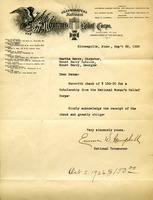 Mrs. Bennett writes with a check for $150 from the National Women's Relief Corps. Emma Campbell, Treasurer of the Women's Relief Corps, sends Martha Berry a check of $150 from the Corps to provide for a scholarship.